Thinking about a North Carolina destination wedding or elopement? Or have you ruled out a destination event because you think you can’t afford it? 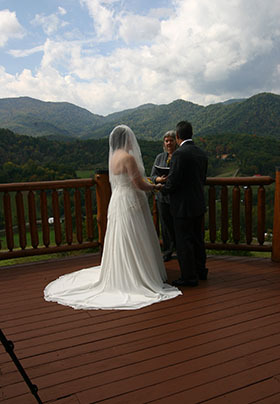 Why not come to Wildberry Lodge, where an Asheville mountain wedding or elopement is affordable with our nuptial packages. Note: Elopements require 45 days advance cancellation notice for refund. A change of event dates is considered a cancellation. Cancellation/Change fee for 45 days or more advance notice is $100. There are no refunds with 45 days of event. Note: Total package amount is due when reserving date. Weddings at Wildberry Lodge are more intimate than formal, structured ceremonies held in churches. Ceremonies are mainly held on the main deck, with a mountain backdrop, at the Forest Retreat in the woods, in the side yard, or at the Tipi. Ceremonies can be moved inside for inclement weather. Since we are a small facility, we can accommodate only small ceremonies with 25 guests or fewer. Because of the openness of the Lodge, weddings are an exclusive event and the property will be blocked for the wedding group. Base costs begin at $7500 (+tax) for 2 nights additional charges depend on the season and details of the event. 7 Guestrooms are included with the venue and are available to wedding group. Contact Glenda for more information. Note: Rooms are available after 4:00 p.m. on the day of arrival. Checkout time is 11:00 a.m. on your departure day. 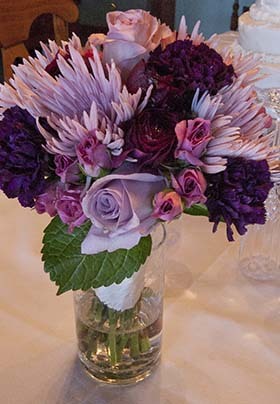 We will be happy to customize an event just for you! Please call us to discuss. Thank you for thinking of us for your event!